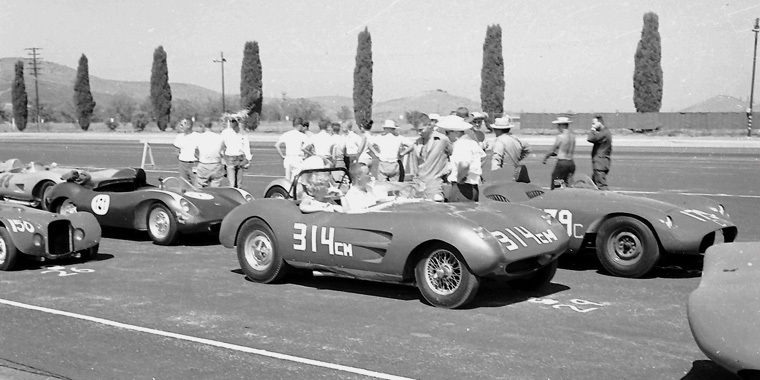 #314 is McCann's Chevy-powered "Teakettle"; #179 is John Albi's Devin-Chevrolet; #121 is John Cooper's "Pignatelli", one of this website's original "Mystery Cars", and #48 is Stan Sugarman's well-known Ferrari 625TRC-Chevrolet. Can anyone ID #150? We see the rear fender of something hidden behind McCann's car: What is it? Is that a Porsche badge on the hood of Cooper's "Pignatelli"? To comment: Please email me! "Car #179 is the Albi Special that I crewed on. I am the guy with the straw hat standing at the rear of the car facing the camera. Also, note the mystery Porsche Special, #121, I only saw that car that one weekend. I also see the Sugarman Ferrari Testa Rossa, car #48. I think this is the lineup for Saturday's Novice race. John Albi was leading, in our car, when he experienced steering problems. Stan Sugarman won the Saturday novice race, with the Ferrari. I talked to him, for quite a while, just prior to the start. I remember the Teakettle, car #314, well." "I am not sure, but think the picture was on Saturday just before the start of practice. It was a hot day and the car overheated in practice. I do not think I attempted to start the Saturday race because of concern about overheating. We decided to add shrouding around the radiator to get better cooling airflow for the race on Sunday where I did start and had the steering problem. We added the shrouding Saturday night in my garage in Arcadia. For some reason we removed the steering wheel and in reattaching it forgot to add the safety nut which created the steering problem on Sunday. I have not thought about this for years, but think that is the story."